The sad news continues. Potoula Kosteas Bourlotos, mother of Tassie Bourlotos, Georgia Bourlotos Smith and George Bourlotos, passed away in Hampton on Saturday, October 20, 2012 at the age of 85. HAMPTON - Potoula M. Bourlotos, 85, of Hampton, passed away peacefully at home surrounded by her loving children on Saturday, Oct. 20, 2012. She was preceded in death by her husband, Mike G. Bourlotos; parents, Panagiotis and Efstathia Kosteas; and son-in-law, James A. Smith. 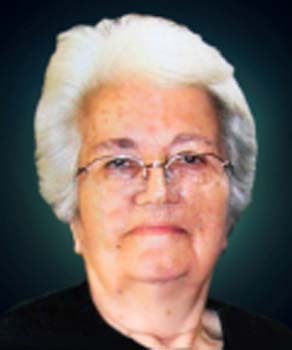 She is survived by her brother, Nikolaos Kosteas; sister, Alexandra Dimitrakakis; her two daughters, Tassie M. Bourlotos, Georgia Bourlotos Smith; and son, George M. Bourlotos; three grandchildren, Amanda I. Krueger and her husband, Mike, Michael G. Bourlotos and Kristina L. Bourlotos; great-grandson, Maxwell L. Krueger; beloved niece, Eleni Chalkias; and many other nieces and nephews in Virginia, New York and Greece. Potoula was born on May 10, 1927 in Anavriti, Greece. She endured war and hardship in her homeland before bravely immigrating to America in the early 1950's, working as a seamstress in New York. Her life here was full; finding love, building a home, a business, and family in Virginia. She raised three beautiful children and worked tirelessly beside her husband, Mike, in their family restaurant until his passing in 1975. Quality time with family and friends filled her retirement years, and she took special joy in watching her grandchildren grow. Her skilled hands were always busy; be it gardening, crocheting, sewing, and cooking. The flowers and vegetables in her tidy garden and the seemingly endless stacks of crocheted blankets were all a testament to her innate patience and love for the quiet art of domesticity. She openly shared her knowledge and talents with anyone lucky enough to know her. Potoula was a gracious woman with a quiet dignity and a steadfast love for her family and devotion to God. Her kindness, humor, and compassion were boundless and never-ceasing. In our hearts and memories, she is still with us, and always will be. We take comfort in knowing she is at peace, eternally united with loved-ones that have gone before her. The family will receive friends from 6 to 7:30 p.m. Wednesday, Oct. 24, with the Trisagion prayer service beginning at 7 p.m., at Peninsula Funeral Home. A funeral service will be conducted at 11 a.m. Thursday, Oct. 25, at Saints Constantine and Helen Greek Orthodox Church, officiated by Father George Chioros, with the burial immediately following in Peninsula Memorial Park. In lieu of flowers, memorial contributions may be made to the Saints Constantine and Helen Greek Orthodox Church, 60 Traverse Rd., Newport News, VA 23606; or to the Alzheimer's Association, Southeastern Virginia Chapter, 6350 Center Drive, Suite 102, Norfolk, VA 23502. The arrangements are in the care of Peninsula Funeral Home. View and post condolences on our online guestbook at dailypress.com/guestbooks. Published in the Daily Press from October 23 to October 24, 2012. Heaven has truly acquired another Angel, for Miss B definitely was one. She was a special woman and a kind person. I will miss seeing her, across the street, working in her garden or her calling me to take her to get Chinese food to-go and insisting I stay and dine with her. We never really lose those we love because they live the rest of our lives with us in our hearts. We went to high school together, and my brother (Woody) was friends with your brother. I think you and your mom also lived around the corner from me in Threechopt Village a long time ago. Just wanted you to know I am thinking about you and your family at this very sad and difficult time. Praying that God will wrap his loving, protective arms around each of you and comfort you as only He can. I know that you will honor your precious Mom and keep her memory alive in your hearts forever. From your Family here at NNS, our hearts go out to you and your family in your time of loss and sorrow. May you and your family have joyous memories in your hearts of your beloved mother today and always, and may the peace of God comfort you through this time. George, Georgia, and Tassie, I was shocked to hear the news about your mother today. I know having so much family close is so helpful in such a hard time. So sorry I can't be there to help with anything ya'll might need. Georgia, George & Tassie - So sorry to hear about your mother. I know how very special she was to all of you. Blessings. Tassie, George and Georgia! I have lost my "Angel." I loved Mrs. B like a mother and thanks for letting me visit and spend some time with her before she left us for heaven! She will forever be in my heart and may God put his loving arms around you all and keep you strong! Dear Georgia, George and Tassie, I am so sorry about your mom. Even though most of my memories are from long ago I have fond memories of her. I loved eating supper with y'all. She always made steak which I never got at home because we were so poor. When I worked downtown I ate lunch at the Capital everyday and she would never let me pay. Later on when she lived in Threechopt Village I would take her to the grocery store on Friday with me. She gave my kids $1's for helping bring in the groceries. I wish I had visited her before she passed. PLEASE call on me if any of you need anything? George, I was very sorry to hear of your mother's passing. We had many good times there at the home on Martha Lee Drive and I think about them often when I drive past on a visit. I hope you are doing well. Take care and I hope to see you sometime. Our deepest condolences are extended to the entire Bourlotos family and their many friends.